So I have been convinced by certain bloggers (hint hint) I need this book in my life, so I went and lovely Bookouture accepted my late NG request. A male detective for a change AND a serial killer on the loose? Yes please! 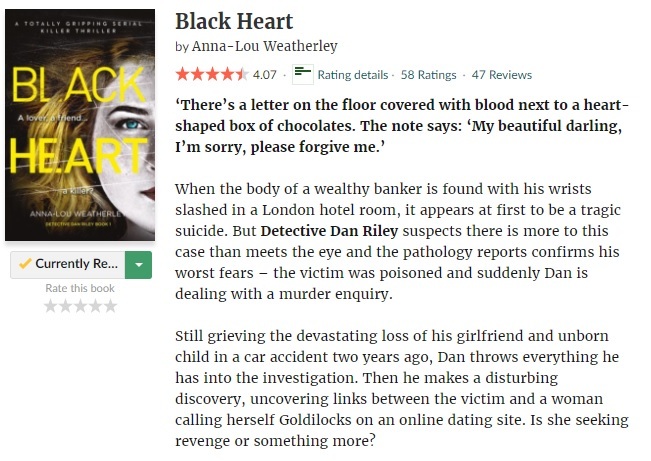 I’m not that far into Black Heart by Anna-Lou Weatherley yet, but it has all the signs of being a winner so far. This entry was posted in Book Memes, Teaser Tuesdays and tagged anna-lou weatherley, black heart, book memes, teaser tuesdays by Yvo. Bookmark the permalink. It was definitely the fast-paced and entertaining detective thriller I needed! I am glad that you decided to read this one Yvo. I hope that you enjoyed it. Looking forward to your review.